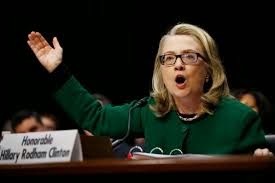 A newly-released government email indicates that within hours of the Sept. 11, 2012 attacks on Americans in Benghazi, Libya; the State Department had already concluded with certainty that the Islamic militia terrorist group Ansar al Sharia was to blame. The private, internal communication directly contradicts the message that President Obama, Secretary of State Hillary Clinton, U.S. Ambassador to the U.N. Susan Rice and White House press secretary Jay Carney repeated publicly over the course of the next several weeks. They often maintained that an anti-Islamic YouTube video inspired a spontaneous demonstration that escalated into violence. The email is entitled “Libya update from Beth Jones. ” Jones was then-Assistant Secretary of State to Hillary Clinton. According to the email, Jones spoke to Libya’s Ambassador at 9:45am on Sept. 12, 2012 following the attacks. “When [the Libyan Ambassador] said his government suspected that former Qaddafi regime elements carried out the attacks, I told him the group that conducted the attacks—Ansar Al Sharia—is affiliated with Islamic extremists,” Jones reports in the email.